Two different fun writing prompts ranging from beginners to intermediate learners of Italian. Students reach Bloom's highest level of Creating with this fun and engaging story prompt about Thanksgiving - a way to make their story personalized, individualized and creative. Writings can be modified to suit your needs. 2 story prompts. First is in the present tense ( but can easily be changed to future, conditional, conditional, imperfect, or the passato prossimo...if you so choose). Prompt 2 is a mix of tenses, but again, can be modified to suit your needs. 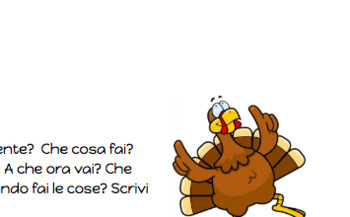 -2 writing prompts about Thanksgiving in Italian. - various creative writing ideas.